Podere Oliveta is located in a certified carbon neutral area that means no air pollution.Podere Oliveta, a country house with pool, consists of two different houses that are home to 5 independent apartments, furnished and decorated with care. All the major attractions and tourist destinations in central Tuscany are within easy reach by car. FALCO.Just up the lane from the farmhouse, there is a smaller farm cottage. The cosy sitting room has 17th-century beams, a good 'terracotta' floor, a sofa and armchairs, a pretty glass fronted dresser, solid dining table and rush chairs. There is a small but very efficient kitchen screened by a low wall in one corner. The double bedroom is quite elegant. A ladder leads up to a tiny gallery with 2 single beds Falco has the attraction of its own raised, flagged terrace, with a barbecue. This is well planted, with olives, yucca and agape. Falco would suit a young family, or make a peaceful retreat for a couple. air conditioning during the hottest months. The stunning views from the 6x12 sq. metres pool. The gardens, with furniture, for al fresco dining and a BBQ, outdoor living space, and amazing vistas all around. Family of four (two teenagers) on vacation in Tuscany. The apartment has a good location within a short distance to Siena, Florence and the Chianti classico wine castles. Nice to cool off in the pool after a hot day. Fabio was very helpful and thanks to Fabio we had one of the best experiences of the holyday at the Palio di Siena, fantastic. The teenagers complained that it was a little hot on “bedroom” under the roof. The internet connection was poor. Wir hatten 8 tolle Tage in der Toskana im Haus Falko. Es war sehr gemütlich und es war alles da was benötigt wurde. Wir würden jederzeit wieder hinfahren, Das ganze drumherum war auch echt traumhaft, wir können es nur weiterempfehlen. Niveau de propreté correct. Piscine bien entretenue. Très belle propriété au calme à la campagne. Wir haben uns in der Wohnung sehr wohl gefühlt. Die Klimaanlage war hervorragend bei der großen Hitze. Sehr schöner gepflegter Pool mit ausreichend Liegen. Alles war sauber und ordentlich. Traumhafter Blick von der schönen Terasse. Der Vermieter Fabio war sehr nett. Casita preciosa, muy comoda y en un entorno idílico. Ojalá que podamos volver con más días para poder disfrutar más de la casa Falco y sus alrededores. La piscina estupenda. Como punto a mejorar, la Red WiFi debería ser mejor (era pobre, navegación muy lenta) Todo lo demás ha estado más que correcto. Nous avons réellement apprécié ces 10 jours en Toscane grâce à ce gite parfaitement situé : joli vue sur San Gimignano, à mi-chemin de Sienne et Florence. Tout y est pour passer un bon séjour en famille ou avec des amis. Merci encore pour le très bon accueil qui nous a été réservé par le propriétaire. Podere Oliveta is an excellent choice to spend really special holidays in a Tuscan country house with pool. Before this amazing experience there will be a short explanation on truffle's life, where it lives and grows and at the end some techniques for traning a truffle dog. Subsequently the excursion, we propose you a delicious lunch based on typical Tuscan dishes with local products and fresh truffles. In just an hour by car you can reach the fantastic sea-side of ​​Tuscany. Do not miss the romantic beaches of the Maremma area. 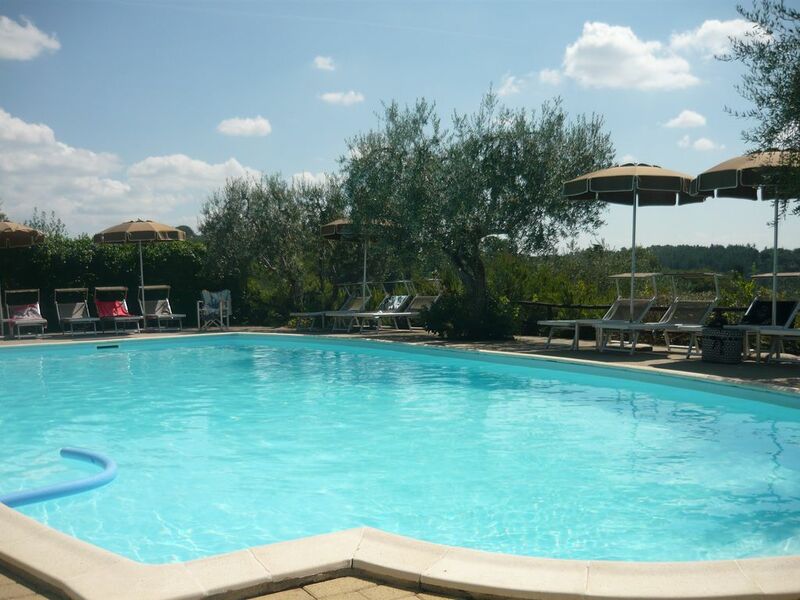 Outside the house there is a lovely swimming pool (12m x 6m) open from May to September. A sun terrace with parasols and sun loungers is available for guests to enjoy endless moments of complete relaxation. Each garden is equipped with outdoor furniture. There is a golf course with nine holes 7 km away, while in Castelfalfi, 22 km away, there is an 18-hole course. The nearest shops and restaurants are only 3 km away, in Poggibonsi, where you can also find supermarkets, banks, pubs, cinemas and theaters. Include: 15 wine tastings, 2 grappa tasting, 3 Evo casting, guide,vintage SUV, gasoline, insurance, lunch. About 6h Tour. Include: Lunch with 3 wine tasting, visit 2/3 villages of chianti, Original Vespa Piaggio, Helmet, third party insurance, guide and training for beginner. About 6h Tour. Include: 1,30h fly overlooking the Chianti Valley, Full breackfast with Champagne, pilot, insurance. Include: 3 wine tastings, 1 vin santo tasting, 1 EVO tasting, guide, insurance and lunch. About 6h tour.